Calgary Folk Music Festival has been a summer staple in Calgary for 36 years. Founded in 1980, the once single day festival has been transformed into a four day long event, featuring artists from around the world. Located on Prince’s Island Park, this musical fair hosts a wide variety of music on eight different stages throughout the island. The crowded space was full of activities for everyone, whether it is drinking a pitcher or two of sangria in the beer garden, or shopping at the artisan market, there were several different ways to spend the days if you weren’t watching a band play. Along with the market and beer gardens, was a row of food trucks that kept festival goer’s well fed throughout the four-day stretch. A couple fan favourites were the Korean spiced fries from Taiko Taco and a scoop of Cookie Monster gelato from Fiasco. Thursday night headliners opened the festival with a bang. Patrick Watson unfortunately caught pneumonia, and had to cancel performing at the festival, much to the dismay of many fans going specifically for him. However, this cancelation led to Shakey Graves taking his spot on the main stage, warming up the crowd for John Butler Trio. Even attendees who didn’t know much about them were blown away, as they put on a fantastic Thursday night main stage show. They had the entire field up on their feet dancing the night away (until you had to leave the island, that is). Friday night brought another day and night of great music. Although Hawksley Workman has a great discography under their belt, the sound and mixing left much to be desired while they played the main stage. After a outstanding performance by Lake Street Drive, Father John Misty (whose real name is Joshua Tillman) took the stage. His stage presence is mesmerizing, as he knows how to keep all eyes on him the entire set. Whether he is standing on the drum kit, dancing with his back to the crowd or writhing around on the ground, he keeps the crowd entertained. He is full of energy and charisma. While he may not be for everyone, there were quite a few people seemingly confused about his performance, he is a fantastic showman and his live performance sounded far better then the recordings on albums. The headliners on Saturday, such as Esperanza Spalding & Buffy Sainte-Marie brought a different feel to the festival, with two female led main stage bands taking the reigns. While Spalding’s performance felt disjointed and a little too quirky (the second half of her performance was unreal), Buffy Sainte-Marie was charming and entertaining on stage. The Mavericks ended the festival on Sunday night with a loud rockabilly performance, which was a great way to end the music filled weekend. This festival has something for everyone, and is an unreal way to spend a weekend in July. There is entertainment for everyone, young and old. 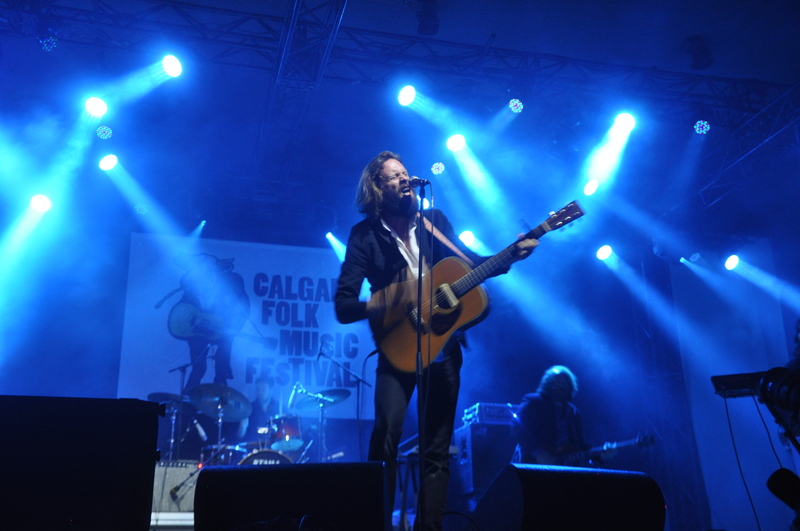 Calgary Folk Music Festival has been running strong for over three decades, and it shows no sign of slowing down.